Mars is typically considered too cold and dry to harbor any extant lifeforms. However, on Earth, microorganisms such as bacteria are found in the most extreme of environments, including under the Antarctic ice shelf and in the Atacama Desert. The ongoing discoveries of water in various forms on and under the martian surface, ranging from subsurface ice to briny liquids creating dark streaks on the sides of crater walls, suggest that water is more abundant on the planet than previously thought. Should water be available to microorganisms in the martian subsurface, this region would constitute the most habitable environment, as the overlying regolith would also shield any bacteria from the harsh ionizing radiation reaching the surface. The regolith may also act as an insulator and serve to temper the large temperature swings, often more than 100 degrees over one martian day, experienced at the surface. Thus, when considering habitable environments on Mars, the subsurface, where the potential for liquid water reservoirs exists, as well as the offering of protection against the harsh temperatures and harmful radiation at the surface is most welcoming. The multiple discoveries of methane in the martian atmosphere, most recently the seasonal variation detected by the Mars Science Laboratory aboard the Curiosity rover, suggest that methanogens may be a possible lifeform present in the martian subsurface. Methanogens are microorganisms from the domain Archaea that produce methane from a variety of substrates. Certain species of methanogen can create methane from carbon dioxide (CO2) and hydrogen (H2), which they use as a carbon source and an energy source, respectively. On Earth, methanogens are the only microorganisms known to produce methane as a result of their metabolism, and they are responsible for most of the methane in the Earth’s atmosphere. As such, a seasonal variation in the amount of methane detected on Mars could be indicative of a seasonal freeze/thaw cycle where a methanogenic community goes dormant during the coldest parts of the year and metabolism is revived when conditions are more habitable. The Kral Lab in the Arkansas Center for Space and Planetary Science at the University of Arkansas has been studying methanogens as models for life on Mars for over twenty years. Aside from being a possible source of the methane in the martian atmosphere, methanogens also do not require organic nutrients, which are rare on Mars, and they are non-photosynthetic, indicating that they can exist in subsurface environments. The four species of methanogens studied in the Kral lab, Methanosarcina barkeri, Methanobacterium formicicum, Methanothermobacter wolfeii, and Methanococcus maripaludis, are all capable of using hydrogen as an energy source and carbon dioxide as a carbon source. 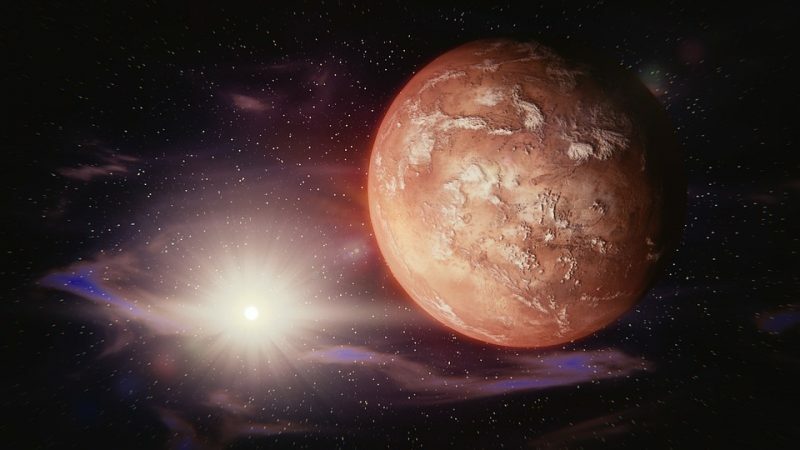 Although hydrogen has not been identified in the martian atmosphere, it is hypothesized to exist in the subsurface and is incorporated into a number of martian atmospheric models. On the other hand, the martian atmosphere is 95% carbon dioxide, offering an abundant reservoir for any potential methanogens on the planet. Despite the regolith acting as a potential insulator for subsurface life, any microorganisms living in the martian soil would still be subject to large changes in temperature. On the warmest day of the year, temperatures may reach as high as 22 ºC (about room temperature on Earth) at midday. However, at night, temperatures can reach down to -100 ºC or below. Despite not being psychrophiles (cold-loving microorganisms), the four species of methanogens studied in the Kral lab have been subjected to growth and survival experiments covering various martian conditions including regolith composition, salt concentration, low pressure, and UV radiation. Mesophilic methanogens such as M. barkeri have also been detected in arctic environments on Earth suggesting that these four methanogens may be capable of survival following exposure to temperatures reminiscent of those on Mars. In “Survival of non-psychrophilic methanogens exposed to martian diurnal and 48-h temperature cycles,” Mickol and colleagues exposed four methanogens (M. barkeri, M. formicicum, M. wolfeii, and M. maripaludis) to 24-hr and 48-hr temperature changes between 22 ºC and -80 ºC. In the 24-hr experiment, methanogen cultures were initially tested for methane production, as well as optical density, which were both used as growth proxies. Next, the cultures were exposed to temperatures ranging between 22 ºC and -80 ºC for 10 days, while optical density continued to be monitored. Lastly, after 10 days’ exposure to low temperatures, the methanogen cultures were placed back at their optimum growth temperatures for 13 days where both optical density and methane production were again measured to determine if the methanogens were capable of surviving exposure to the freezing temperatures. The 48-hr experiment was conducted similarly, however, the exposure period was 12 days long and the post-exposure incubation period was 10 days. Increases in both optical density and methane production indicate that methanogenic cultures are active and growing. In both the 24-hr and 48-hr experiments, M. wolfeii cultures increased in both optical density and methane abundance following exposure to the freeze/thaw cycling. Cultures of M. formicicum demonstrated increased methane production following exposure to freezing temperatures in both experiments, however, optical density decreased throughout the entire post-exposure incubation period. For M. barkeri, some cultures increased in methane production, while other cultures decreased, although on average, there was a slight increase in methane abundance following exposure. Cultures also demonstrated great variation in optical density, but average optical density also slightly increased for cultures of M. barkeri in the 24-hr experiment. Unfortunately, the effect of freeze/thaw cycling on cultures of M. maripaludis remains unknown due to the rupture of test tubes during the exposure period. Overall, despite varied results among the multiple cultures of each species, exposure to freeze/thaw cycling may not necessarily be lethal for non-psychrophilic methanogens. Interestingly, the methanogen that demonstrated the greatest increases in both methane abundance and optical density is classified as a thermophile and grows best at 55 ºC (131 ºF). Methanosarcina species typically form multicellular aggregates and this may serve to protect cells against extreme conditions. Methanothermobacter wolfeii and M. formicicum are both members of the methanogenic order Methanobacteriales, which has also been detected consistently in permafrost communities, although at low levels. Ultimately, the results from these experiments suggest that the low temperatures on Mars may not be inhibitory to the possibility of life on the planet, specifically in the subsurface. Further experiments exposing microorganisms to martian temperature extremes are warranted, using longer timescales as well as psychrophilic species. These findings are described in the article entitled Survival of non-psychrophilic methanogens exposed to martian diurnal and 48-h temperature cycles, recently published in the journal Planetary and Space Science. This work was conducted by R.L. Mickol from the University of Arkansas and the American Society for Engineering Education, Y.A. Takagi from Oberlin College, and T.A. Kral from the University of Arkansas. Previous Post« Previous How Long Is A Decade In Years?